The trend of interior design these days are modern design. 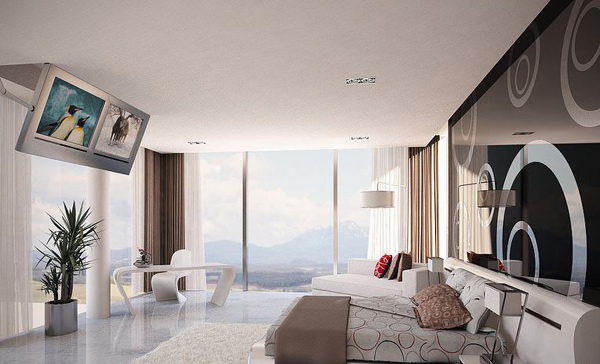 This kind of interior focuses on function and uses sleek lines for the furniture and other elements in it. It looks clean and has that simple look yet lends a subtle luxurious appeal and sophistication. Most of these spaces use earth tones, grays and even pastel colors. But there are also modern interiors that has bold colors in it. 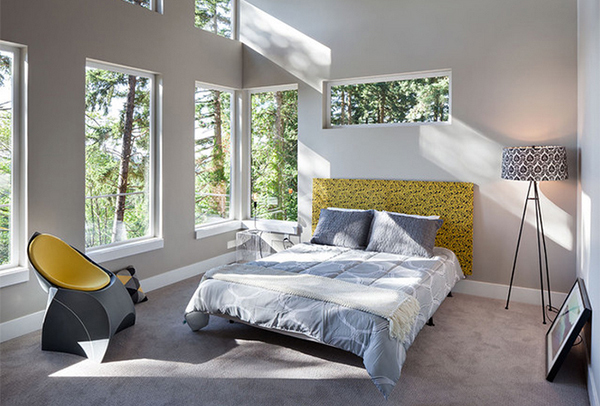 Today, we will give you a list of modern bedrooms. 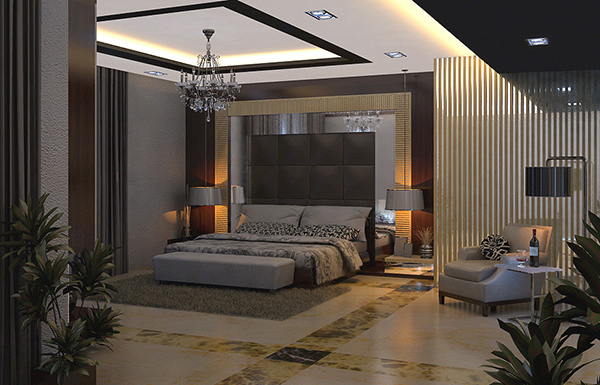 You will notice the common factors in each interior like the design of the furniture, crisp drapes, and its tidy look. A modern bedroom is always free of clutter and will merely drive the eyes to its lovely modern elements from the furniture to the lighting. You will better understand how a modern bedroom will look if you scroll down and take a glimpse of the list we have for you today. The beautiful portrait on the headboard drives anyone’s eyes to it. The white shag area rug and floor to ceiling drapes in white and purple make this bedroom appear even more attractive. 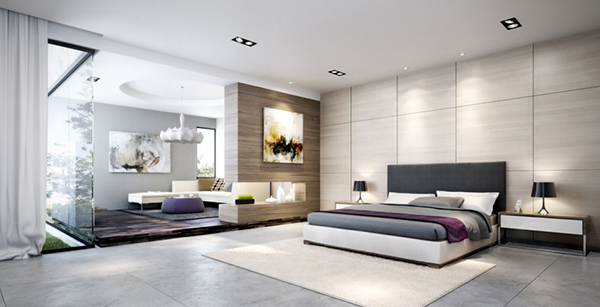 This white modern bedroom is a space with light and airy aura given some light and pale color accents. Get a brush of simple sophistication in this modern bedroom that looks totally serene. 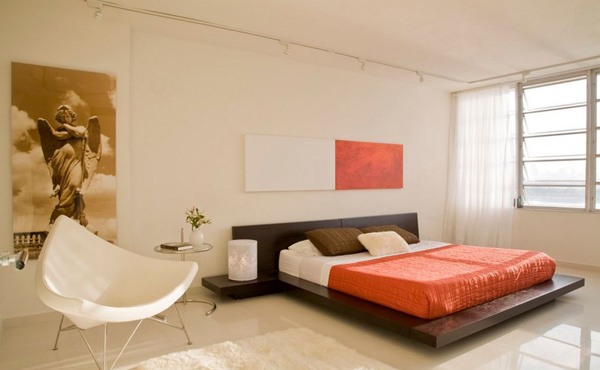 Sleek furnishing and clean lines make up this minimalist modern bedroom that sparingly used orange tones in it. Grab hold the luxury of style from this bedroom in satin covers and area rug comprised of circles. What an airy and cozy bedroom this is! 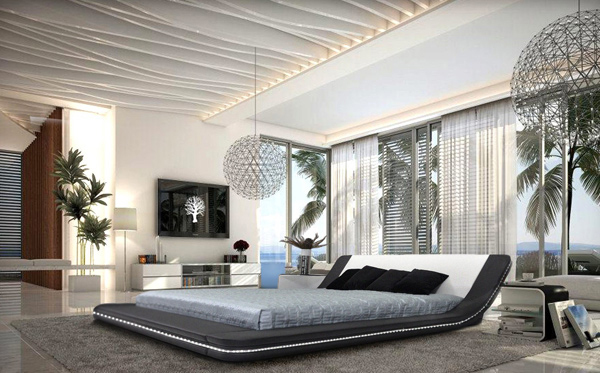 Aside from the leather platform bed, the pendant lights on both sides of the bed look spectacular too. Earth tones bring in warmth and coziness to this bedroom with a sloped ceiling. The printed yellow headboard looked awesome with its light fray backdrop. 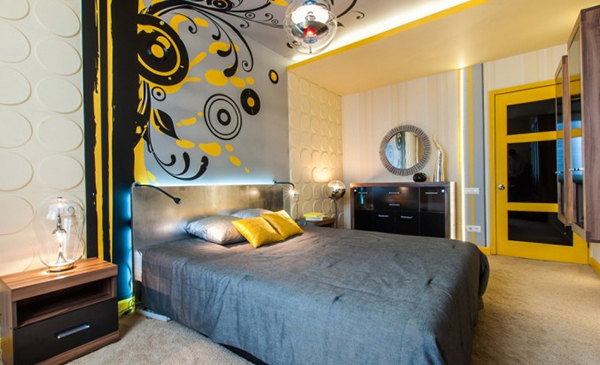 The wall art looks grungy and retro but it retains the modern look of this bedroom. Circles on the glass of the headboard for this modern bed is just stunning and would let light bounce around the bedroom. The bedroom got it dramatic feel from the grey oak woodwork, pietra seriena limestone, vintage black wood floors, concrete walls, and white glass partitions. This modern bedroom is has lovely accents on as well as the combinations of patterns and materials. The brick wall background in white gave more highlight to the yellow bed and shelves in this modern bedroom with a light industrial touch. 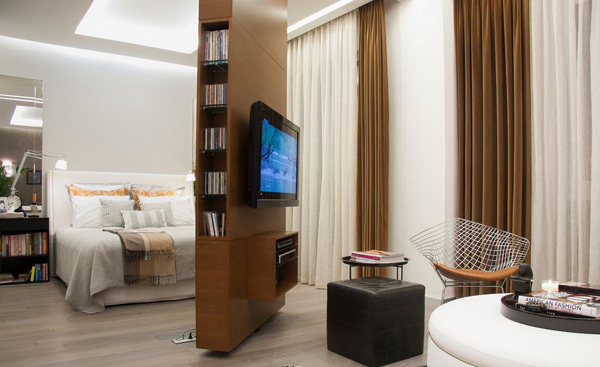 For an apartment with limited space, it would be awesome to have a divider like this one to reveal the bedroom with light relaxing colors. Wall insets and cozy lighting is dramatic additions to this gray and chocolate brown haven. 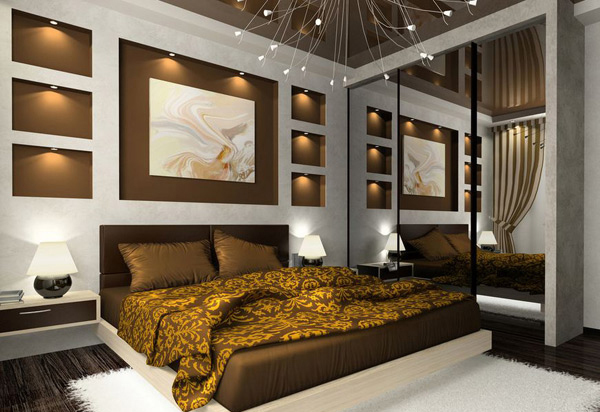 We are sure you would want to get a bedroom as lovely as the ones above. Notice that the spaces above have little furniture in it because only those that are important and functional were added to the bedrooms. There are also accent furniture but these too have their own uses. You could also notice that the colors are done well and it is free of visual clutter. 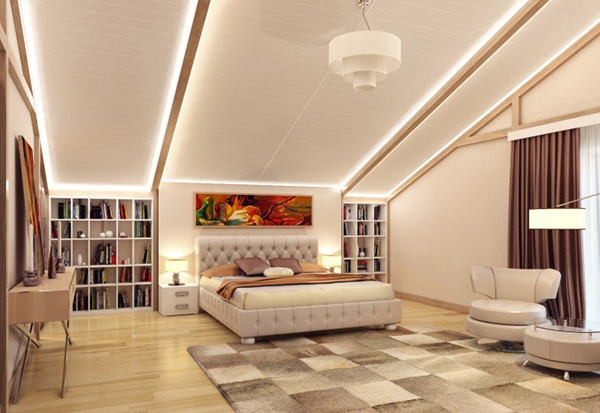 Would you love to get a modern bedroom? 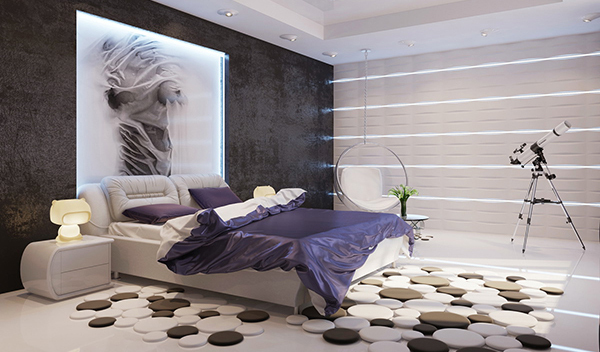 You can easily turn a modern bedroom into a romantic bedroom merely by adding some little seductive touches to it.